You see an elderly person stumble and fall. The age-old answer in this scenario is to go and extend a helping hand. But not in today’s China. Last August, the state-run Hebei Television Network highlighted the case of middle school student Xiao He assisting an elderly man who fell off his motorcycle in the middle of a road on a rainy day. Xiao He told the station he was pedaling home on his bicycle when he saw the unnamed elderly man take a tumble. 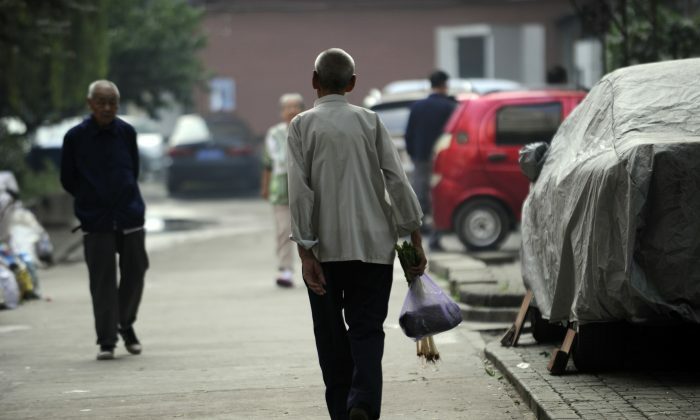 He hurried over, helped the elder to the roadside, and dialed 120, China’s emergency number. The elderly man, however, claimed the kid “came at me head on” and “tripped” him up. As it turns out, a camera caught the incident and verified Xiao He’s version of events—the grainy footage showed that the middle school student and the elderly man never touched each other in the accident. In recent years, the China’s senior citizens have resorted to fleecing complete strangers (and even the policemen, in one documented case) who help them to their feet from either real or faked falls. Experts blame the rise of this phenomenon to declining public morals and living expenses, including health care costs, that many cannot afford. Often, the elderly who claim to have been injured seek hefty sums of compensation, and occasionally get their cash bounty if the case goes to court. The phenomenon is so worrying that Chinese insurances companies have even started to roll out affordable policies (which cost 50 cents a year) to allow do-gooders to do good. The insurance policy compensates them if they are falsely accused. But China’s swindling seniors have also harmed those who genuinely hurt. 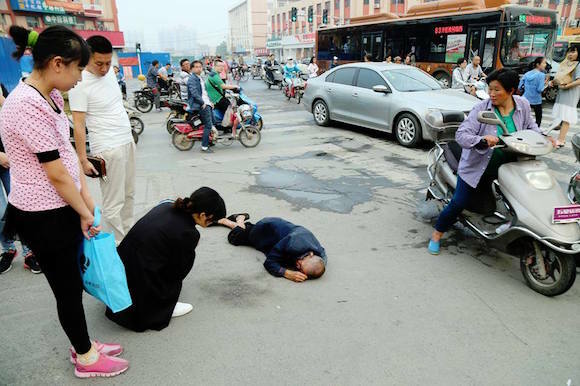 Last September, no passersby in Zhengzhou, a city of Henan Province in central China, dared to aid an elderly man who fell in the street and bloodied his face. A month earlier, things took a tragic turn in another Henan city. An elderly man suddenly fell from his scooter while on the road in Kaifeng, and struggled in ankle-deep rainwater, according to Henan Television Network, a state broadcaster. As he lay in the water, no one dared approach the elderly man despite the exhortations of onlookers. He was found to have died of an unknown cause after a group of passersby pulled him out of the water three minutes later. Frank Fang contributed to this article.